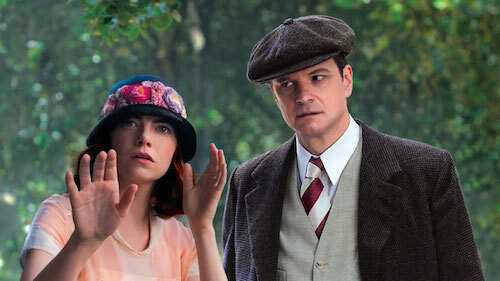 Synopsis: Set in the 1920s on the opulent Riviera in the south of France, Woody Allen’s Magic In The Moonlight is a romantic comedy about a master magician (Colin Firth) trying to expose a psychic medium (Emma Stone) as a fake. Because of his personal life, many people avoid Woody Allen’s films like the plague. Like Roman Polanski and Victor Salva, Allen has found himself at the center of a handful of scandals that have become synonymous with his career, and that’s a shame. Because, no matter what one thinks of the man on a personal level, it’s hard to argue against the fact that he knows how to make movies. The latest proof of his cinematic ability comes in the form of his new comedy Magic in the Moonlight. Magic in the Moonlight stars Colin Firth (The King’s Speech) as Stanley Crawford, an accomplished and respected British illusionist. A fellow magician named Howard Burkan (Simon McBurney from The Last King of Scotland) shows up at one of Stanley’s performances and asks for help; a young woman who claims to be clairvoyant is trying to swindle some money out of the family of one of Howard’s friends, and he wants Stanley to help prove that the woman is a fraud. Stanley accepts the challenge, and travels to the country to meet the psychic Sophie Baker (The Amazing Spider-Man‘s Emma Stone) and her mother (Marcia Gay Harden from The Mist). From their first encounter, Stanley is amazed when Sophie tells him things about himself that she could not possibly have known. His curiosity is peaked further when he attends a seance in which Sophie purports to contact the spirit of the dead husband of Grace (Stoker‘s Jacki Weaver), the matriarch of the family who is ready to sign a check over to Sophie and her mother. After watching her work, Stanley cannot for the life of him figure out how she is pulling her scam, a fact which intrigues him to the point where he starts to have romantic feelings for Sophie. Unfortunately for Stanley, Sophie has also attracted the attention of a young suitor named Brice (Hamish Linklater from “The New Adventures of Old Christine”), so he finds himself in a complicated love triangle that is made even more complex by the fact that he still intends to prove that Sophie is a fraud, just as soon as he can figure out her methods. Although his older films such as Annie Hall and Sleeper are classics, Woody Allen’s newer movies have been hit and miss. Magic in the Moonlight is a hit. It’s an extremely enjoyable not-so-romantic comedy that has a lot of fun with its subject matter, and that fun is passed on to the audience. There’s nothing too heavy in the film, and that’s a relief. Magic in the Moonlight is a lighthearted romp that proves Woody Allen hasn’t lost his auteur voice, even when he’s making a playful movie. Allen combines a witty script, excellent costuming and production design, stunning visuals, and a charmingly charismatic ensemble cast to create a wonderfully fulfilling cinematic experience. Everything comes together in Magic in the Moonlight, making it into what is easily one of the strongest films of Woody Allen’s recent career. Writer’s Note: Unfortunately, Magic in the Moonlight has been under a bit of unfair scrutiny because of Woody Allen’s personal life. Specifically, some viewers have noticed the age difference between Emma Stone and Colin Firth (she is 25, he is 53), one which seems to echo his own preferences for younger women. The interesting thing about that observation is that it really isn’t all that apparent; Firth is a very young 53, Stone plays an old-souled 25, and the May-December romance element is hardly a plot point at all. It just seems as if people are looking for some kind of insight into Allen’s character, hoping that they’ll find a reason not to like his work. In the end, it’s too bad for them, because Magic in the Moonlight is a darn good movie. The screenplay for Magic in the Moonlight is a breath of fresh air amongst the standard romantic comedies that clutter up theaters today. Woody Allen has an amazing knack for dialogue, and this film illustrates it nicely; it’s full of the quick quips and verbal jabs for which Allen’s movies have become known. The writing is smart and creative, and that’s not just limited to the spoken word; the plot itself is packed with lots of clever twists and fun surprises that are guaranteed to provide the viewer with plenty of “ah-ha!” moments. Also typical of Allen’s movies, there is an existential crisis in Magic in the Moonlight, but it’s one that is also presented in an unexpected way, with Stanley getting frustrated over not being able to prove Sophie a fraud and starting to maybe, just maybe, believe that she really is a psychic medium. Woody Allen often follows a formula for his screenplays, but the formula works, and if it isn’t broken, why fix it? The style of humor that is found in Magic in the Moonlight is typical of what audiences have come to expect from Woody Allen’s movies. The comedy is almost completely verbal, but the combination of dry wit and straight delivery makes for some surprisingly hilarious moments. Those who enjoy Woody Allen’s sense of humor will find the film funny, and those who don’t, won’t. It’s more of a smile-knowingly type of film than a movie that’s full of laugh-out-loud gags, but that works in its favor; there are tons of Allen’s signature snarky one-liners and snappy comebacks in the film, and any roaring laughter would run the risk of drowning out another line that is equally funny. Woody Allen’s humor is a fun mixture of intelligent and silly, and it is on full display in Magic in the Moonlight.